See Allen in front of the canvas. He is breathing heavy in a fragile calm. The colors before us are read and black. He apologized to me for what we were about to experience. He offered this apology from over his shoulder with a half-face. This apologetic notion threw me into a tangled state only he could unravel. Why apologize? These were the words bouncing around me. “Morgan”, the last name of the family that sexually abused and tortured Allen, “begins with a capital M.” Allen said between breaths. “M stands for Morgan. M stands for Monster. For Murder. For Molester. For Monster. For Masochist. It stands for Monster.” These words left his lips behind a quivering exhale. What a demonstration. I took a choice glance at Cheryl. She could be found behind her camera. We could all be found in a state of suspenseful animation. Red and Black continued their dance before us. Allen continued his narration. We followed along with our ears, eyes, and hearts, yet, we knew nothing of where we were going. And there, behind it all, all of us fell into the red hallways of Allen’s memories. Of all that has passed in his stream of life. In his hand, a pallet of white paint. What a sight to behold. A man, An Artist, a survivor of the worst kind of sexual abuse, surrounded by his colorful lifeworks wrought from a life of color. It was colors and cement walls around us. Hanging lights and cameras. And us. On our own islands of experience. And now we were upon the other’s beaches. A pure moment of human connection. After Allen finished the foreground, he had these words for us “After Mr. Morgan raped me, he continued to threaten me so I wouldn’t tell my family what he and they were doing to us.” Oh, the shrill of life these words were possessed of. And he said them, unafraid, unhinged, and aware. Allen went on to explain how the Morgan’s - aside from the conducting horrific ritualistic sexual abuse of children – sacrificed animals. Dogs in particular. Upon hearing this, we all met each other once more in the space through synergy. Allen’s hands put themselves into that white pallet of paint which reconstructed the white husky puppy that Mr. Morgan stomped into death on the cold pavement in front of Allen’s childhood eyes. His hands reconstructed the white dog with an empathetic fury. With grave outpouring. It was bloodied truth manifested before my brown eyes. See me somewhere between here and there. Somewhere between the colors and the words and the rhythms. And I was to find myself in my body, disconnected. A dark and spacious place. And through this dissonance I found my footsteps. I retraced them back through time, with careful feet, and found the corridor of self. Somewhere between, the two halves of me met in the here, now, and I was once more amongst friends. No longer separated form humanity. This work takes it’s toll on the human soul. Allen finished putting two black dots on the painting which were the eyes. The eyes of the dog Mr. Morgan killed in front of Allen when he was a child. I had to euthanize my dog, Cosmo, several days prior. This is why Allen apologized before we began this painting. I remember watching the life pour from Cosmo. And in his wonderful brown eyes, he assured mine, which were full of tears, that everything was going to be okay. That it always was okay. This experience took all of 15 minutes, however, the emotions emoted will find themselves in the bulwark of my soul, of our souls, in the soul of this project. I know not whose eyes my words may reach. And I know nothing of your life, of all that makes you, you. But here, I have built this bridge for you. A bridge built upon the bricks of this day. Bricks fashioned from how our souls experienced this day. Bricks fashioned from the sexual abuse we experienced as children. Here we are. And you are. And wherever you find yourself, I insist you allow a cold shrill of inspiration to shock you back into yourself. Realize you are reading these words, breathing, thinking, feeling and feel compelled to share this human experience of feeling with another in your life. Continue building bridges with us. Help us make this would a little more understandable. Help us end the sexual abuse and exploitation of children through contemporary art. When I think about the sexual abuse I endured as a child, I am struck by how similar those experiences are to horror movies. I often wonder how many people who make horror movies were sexually abused as children. When I think of monsters I think of real people. I don't think of think of imaginary creatures. I often wonder how many horror stories have their origins in all forms of childhood abuse. In this collage, I portray monsters coming out of a house in a mountainous forest region. I have the Childhood Fractured Rescue Chopper swooping in and rescuing the girl from her monsters. The inspiration for this came from the desired to be rescued. I had this desire every moment during my abuse and even after into adulthood. I know we can't swoop in and rescue children but there are things we can do. I make art. I talk about it. I educate people about it. What can you do about? Please contact us if you want to get involved or partner with us! 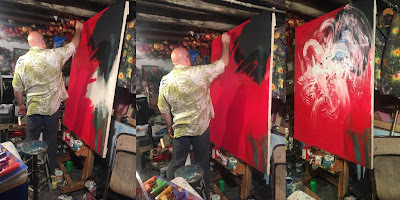 My Experience With Painting Number 2 "The Wedding"
We found ourselves in the studio. Allen was in front of his canvas. It was primed with black. Cheryl was behind her camera. She is always in more than one place. I was on the same green chair I am always on. Sitting there, head cocked, making sense of it all. Allen asked if we were ready. Perhaps. And from here, the pendulum of creative emotions began to sway. I got married when I was 6 years old. Allen said this from deep within himself. What baffling words these are. Words that are laced with a complicated poison still unknown. My head cocked from one side to another from the attention commanded by them. It was all outside myself. Outside the beleaguered straitjacket of “I” that - if it can be found inside the dusty confines of possibility - “I” was provided recess from the confines of “I”. And with this, “I” was gifted new eyes to see the world of another. Allen, with his hands smeared with green paint, gave life to the backyard that could be found in his memory. It seemed quiet. His brush glided across the canvas sloppy in its perfection. And then he mumbled something worth a thousand sonnets. Something I would write around if I found myself having the time. Time. Time. And with time comes memory. And of this painting that comes from Allen’s memory he had to say It was like a dream I had last night. It is a dream that always happens the same way. These, however, are the dreams of reality. Dreams of the past. And this dream was of Allen being forced to marry the daughter of the family that sexually abused him. The Morgan Family. Allen pressed on. The painting had taken on a character of its own. We were given a green foreground. And amid the commotion, the words, and the levity of it all, I fell nullified. My eyes were staring at the canvas. My mind was staring it all in the face. The face of barbarity. The face of sexual abuse. The face of children. From this stream of events Allen was given a memory of being forced to marry a girl who was complicit in the treacherous acts against the sovereignty of childhood. Allen began giving form to those involved. He did this with figures of slight abstraction. The antagonist of the scene was the elder Morgan sister who could not have been more than 12 years old. Children enacting marriage would be considered acceptable. Some may even find it adorable given the context in which it happened. This is neither given the context. What’s more is my task to catch, through the fishnet of words, the memories lost in the hallways of time. Allen was near completion. He was tying up the always loose ends of aesthetics. His body quivered in re-creating the scene. Quivered from giving form to his younger self, Mary, and the older sister. And the other kids of the neighborhood who were complicit in this act. After creating the forms of all involved streams of yellow and green could be seen in their place. A brown river carved through the canvas that took the form of a fence. How subtle are the nuances of this work? This is question if often ask myself. And I often find myself without answers. For I am one person in this cloud of many. What is that I, this one man in a cloud, can do to end the sexual abuse of children. Who am I to say I want to end the sexual abuse and exploitation of children. And from this green chair, as the session was in its commencement, I was once more struck by profundity. I sat in this chair. And on this chair I was to feel a thousand set of eyes upon me. The eyes of children who have never had someone to speak for them. And they were there with us, guiding our creative continuity with clairvoyant hands. They told us to keep stride. To never falter.